The International Marlin and Tuna Fishing Tournament will be held in La Cruz de Huanacaxtle between July 12 and July 14, 2012. This influential village is located in the northern part of Banderas Bay, where visitors can enjoy spectacular views and the exciting sport of marlin and tuna fishing. The tournament receives a healthy number of sport fishing fans, from the Riviera Nayarit, other Mexican states, and even other countries. Every year is different, as the strategies for marlin and tuna fishing are evolving all the time, meaning that every team has to keep up to take home the big prize. The major attraction of the event is the marlin, known as one of the most elegant fish in the ocean, and definitely one of the fastest, reaching a top speed of over 60 mph. The challenge for the competitors is to create a strategy to conquer the blue marlin, outwitting the instincts of the fish, and battling the fury of the ocean. Another attraction of the event is tuna sport fishing. The tuna is a migratory fish that travels enormous distances, and has a particular affection for the coast of the Riviera Nayarit. The fish stands out for its blue color and silver belly, along with its strength and cunning in evading captors and predators. All of the sport fishing participants will have the objective to hook a good sized tuna as a prize, along with an "elegant sailfish". 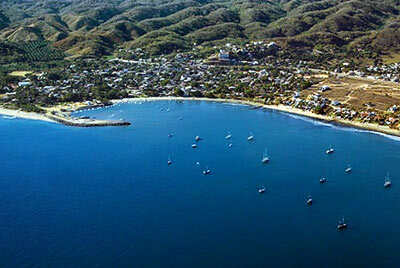 Enjoy the experience of competing in the International Marlin and Tuna Fishing Tournament, in La Cruz de Huanacaxtle. During your time here you can enjoy a fantastic stay in one of the hotels in the Riviera Nayarit, and admire stunning sunsets from the bay or on the beach. You might even be able to savor the sight of a sailfish jumping on the horizon!